Find some void salts for an inexperienced sea captain. 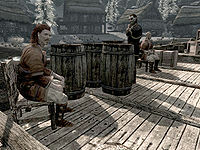 Speak to Captain Wayfinder on his ship at the dock in Dawnstar. Retrieve the salts from the given location. Return to Captain Wayfinder and receive your reward. In central Dawnstar, you will find the ship The Sea Squall permanently docked, with inexperienced sailor Captain Wayfinder and his team of disrespectful crewmembers wandering around on deck. Talk to Wayfinder and ask him about the ship and he will provide a bit of background information on his questionable status as captain. He will also hint at problems with his latest shipment, some fine-cut void salts from the College of Winterhold that have gone missing. When asked what happened to the salts he will reveal: "Sailors are what happened to them. They got drunk and ended up losing the merchandise in some cave. If you're not afraid of little exploring, I'll pay good gold to get those salts." At this point, it is no longer possible to reject the favor and a map marker will point towards one of eight radiant locations. Travel to the selected location and locate the fine-cut void salts in the boss-leveled chest, then head back to Dawnstar and the Sea Squall. When you hand him the salts, a grateful Captain Wayfinder will hand you a leveled amount of gold, with his thanks: "That's the first bit of good news I've had since I set sail a year ago. Here's your cut." The fine-cut void salts that you are asked to find are actually just regular void salts, except it is a unique sample of the salts that have been given a different name. All eight samples of fine-cut void salts spawn in the possible locations when you first visit Dawnstar. Finding them will not start the quest and only the sample indicated after speaking to Wayfinder will function as a quest item and net you the reward. If the game decides to send you to a location where you already found the salts, and you still have the original sample in your inventory, a new sample will spawn at the location, but you will miss out on the map marker. If you find any of the samples before starting the quest, the fine-cut version can be consumed like normal void salts. Trying to consume the salts selected for the quest results in the rather rare error message "You cannot eat quest items." The fine-cut void salts may stay in your inventory after receiving the payment and finishing the quest. This often happens if you have regular void salts in your inventory (or if you carry another sample of the fine-cut version) when you return to Captain Wayfinder. They are no longer a quest item. It's possible to run across a second batch of fine-cut void salts in another location. If you've already completed the quest, you can turn them in again for another reward. If you find a sample of Fine-Cut Void Salts prior to obtaining the quest, it will automatically put the quest in your Miscellaneous log. If you then speak to Captain Wayfinder and pick any topic other than, "I have the Fine-Cut Void Salts", he will finish his dialogue and then never speak to you again, making it impossible to finish the quest. This can sometimes be fixed by using the console command setstage freeformshipsDawnstar 20. When it works, this ends the quest and removes the fine-cut void salts from your inventory. This bug is fixed by version 2.0.9 of the Unofficial Skyrim Patch. The following empty quest stages were omitted from the table: 200. On the PC, it is possible to use the console to advance through the quest by entering setstage FreeformShipsDawnstar stage, where stage is the number of the stage you wish to complete. It is not possible to un-complete (i.e. go back) quest stages, but it is possible to clear all stages of the quest using resetquest FreeformShipsDawnstar. This page was last modified on 9 February 2015, at 10:31.